With huge pressure on recreation resources in many western countries opportunities for motorcycle adventures off the beaten track have reduced as vehicle-based recreation is shut out by the all-powerful foot, pedal and paddle lobby. Here in NZ, with a small population and ample outdoor space to share, there are still many opportunities for clubs and groups to organize adventurous motorcycle rides in back country areas. While there are many clubs and organizations putting on hard-core trail rides, those catering for broader on/off road adventure riding are still relatively scarce. It’s rather refreshing to discover the Northern Gravel Adventure riders, a very active organisation which centres all their activities around road legal dual purpose bikes. More than just putting on rides the NGAR actively encourage beginner riders and all sizes and makes of bikes, from big adventure twins, to small capacity road legal trail bikes. Their runs range from one-day public road gravel road rides to private access events and even multi-day rides. Many NGAR rides are centred around Auckland, but the group range further afield into Northland, the Central North Island and for special missions, even further afield. 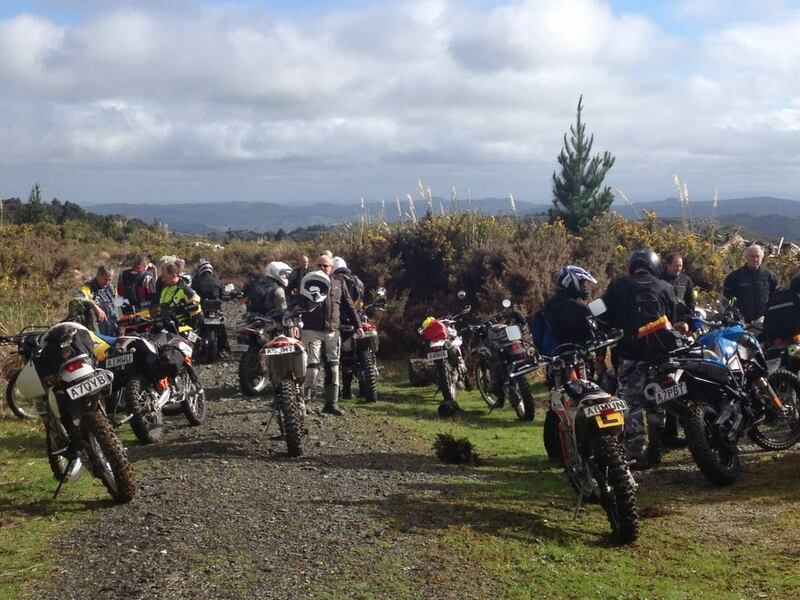 I recently joined the NGAR Mystery Forests ride just north of Auckland. 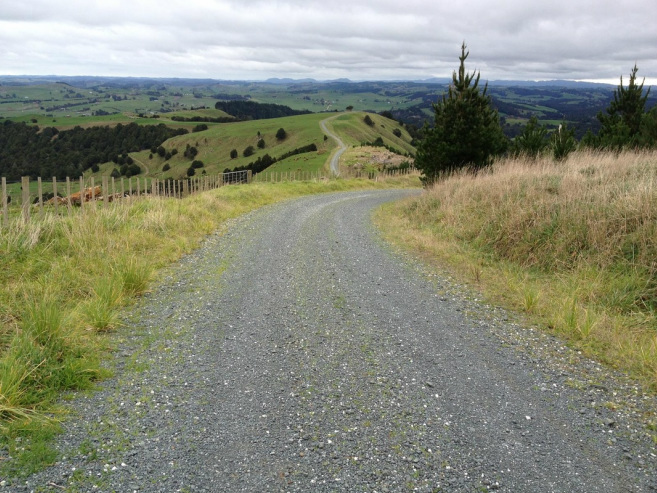 The ride was open to all road legal adventure bikes and was billed as an introduction to some of the private plantation forests between Auckland’s North Shore and Warkworth, thirty kilometres north, and would be suitable for riders of all skill levels. Northland’s winter clay is seldom anything less than slippery. True to their word Jim and Sue Denham who run the NGAR had mapped out an entirely realistic ride considering that our group ranged in experience from world-girdling adventurers to L-plated beginners still on the steep ramp of their skills building. Compounding the range of skills was the wide range of machinery, from knobbly kitted Husaberg enduro racers, to road-tyred big twins. Northland’s winter clay is seldom anything less than slippery and this was confirmed by heavy rain overnight, though the day itself was fine. The ride started on the outskirts of the North Shore and after some pleasant gravel backroads through the Puhoi Hills and a short scoot down Highway 1 we were soon following the shingle deeper into private forest south of Warkworth. As the tracks became rougher it was time for the group to split in two, those pushing on cross country with Jim over muddy tracks ridge-line tracks, and those opting to follow Sue around the gravel deviation. When the next valley was reached the two groups re-joined and we continued to our second forest for the day where the same protocol was put in place, the mudlarks following Jim and those with bigger bikes, less experience, or shod with road tyres taking a different, though not always shorter route. The lunch stop was a tasty catered affair at a local café. So we spent our morning, pleasantly skidding around the surprisingly steep hill country forests, with stops punctuated to take in views of distant coasts or the town of Warkworth, seemingly always from a different direction. The lunch stop was a tasty catered affair at a local café and a good chance to strip down some layers and socialise with the some of the 25 or so riders in the group. As is usually the case when food, cakes, coffee and bike talk are involved it was over an hour before we were winkled out and back on the gravel again. Unsurprisingly the afternoon involved more gravel back roads, more clay tracks, a good few skids and more expansive views from the hilltop re-groups. Only the low angle of the winter sun could end the fun. All too soon the ride was over and the riders disbanded and headed home in various directions, muffled again with extra layers to ward off the inevitable chill that follows a crisp, clear day.